Rux Martin/Houghton Mifflin Harcourt, 9780544520608, 22pp. Whiskey fever is sweeping the nation. Every day, craft distilleries are popping up in remote counties and urban centers, offering a wealth of great choices to consumers—and just as many puzzlements. Does the introduction of a simple “e” to go from whisky to whiskey mean anything? What’s the difference between Scotch and Rye? What’s Canadian whisky anyway? And what about the whiskeys of Scotland, Japan, and Ireland? Where's a humble Joe to start? 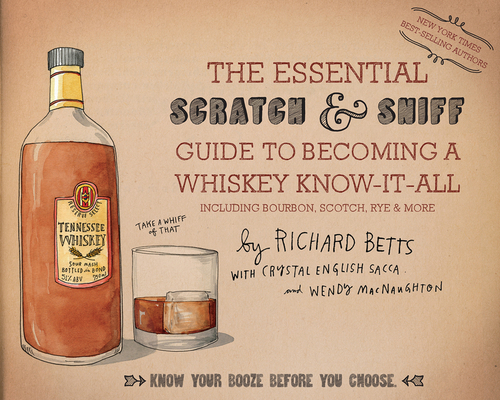 In this witty kid-style book on an adult topic, Richard Betts boils down his know-how into twenty pages, cooling our “brown-sweat” anxieties and dividing whiskey into three simple categories: Grain, Wood, and Place. While most whiskey tomes are about as fun as a chemistry lesson, Betts makes the learning slide down easy, reassuring us that this exalted spirit is just distilled beer and, through a nasal romp, helping us figure out which kinds we love best. Humorous illustrations and scratch-and-sniff scents (vanilla, sandalwood, grass, and more) help would-be connoisseurs learn their personal preferences. Language label and Map to Your Desires included. RICHARD BETTS is the author of the New York Times bestseller The Essential Scratch and Sniff Guide to Becoming a Wine Expert. He has been featured in the New York Times, Wine Spectator, Food & Wine, Outside, GQ, and Details and speaks frequently on wine throughout the country. He is also the founder of two wine companies, Betts & Scholl and Scarpetta, which have won top praise from leading wine publications. He is also the founder and president of Sombra Mezcal and Tequila Astral, and his newest wine ventures include Saint Glinglin Bordeaux, My Essential Red, My Essential White, and My Essential Rosé. CRYSTAL ENGLISH SACCA is an award-winning advertising art director. WENDY MacNAUGHTON's work has appeared in the New York Times and the Wall Street Journal.